Since tiger lilies bloom late, this flower is a great one to make right now. I made this orange tiger lily a while back, which was a special one for me. And today I’m sharing a new version! 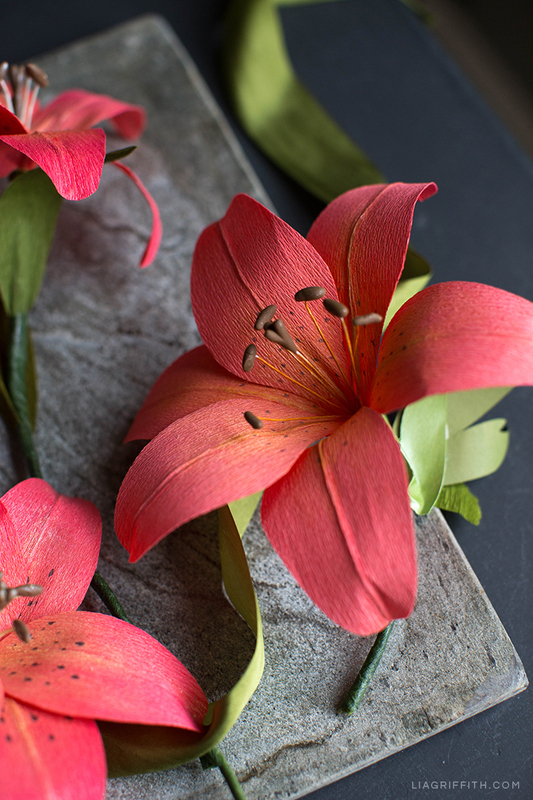 Similar to a real tiger lily, this crepe paper tiger lily features fiery, red-orange petals with spots. Want to see how I made this striking flower? Scroll down for the instructions as well as a video tutorial. I would say this crepe paper tiger lily involves a bit more work than my orange lily, but it’s worth it! The vibrant colors are stunning and so perfect for fall. And they’ll instantly brighten up any room. 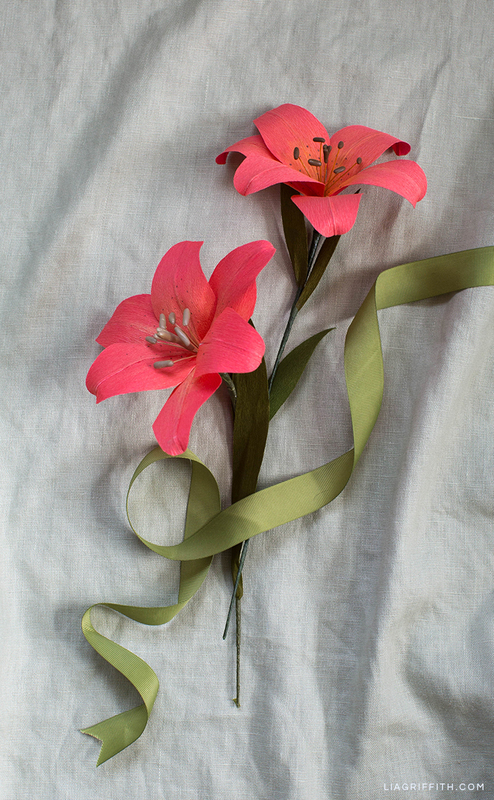 For these tiger lilies, I used my double-sided crepe paper to make the flower petals and leaves (linked below). I also used PanPastels to color the petals and make them look more realistic. And I used art markers to create the dots you see in real tiger lilies. It’s always my goal to create paper flowers that look natural, which is why I think the extra materials, tools, and steps for this one make it worthwhile. 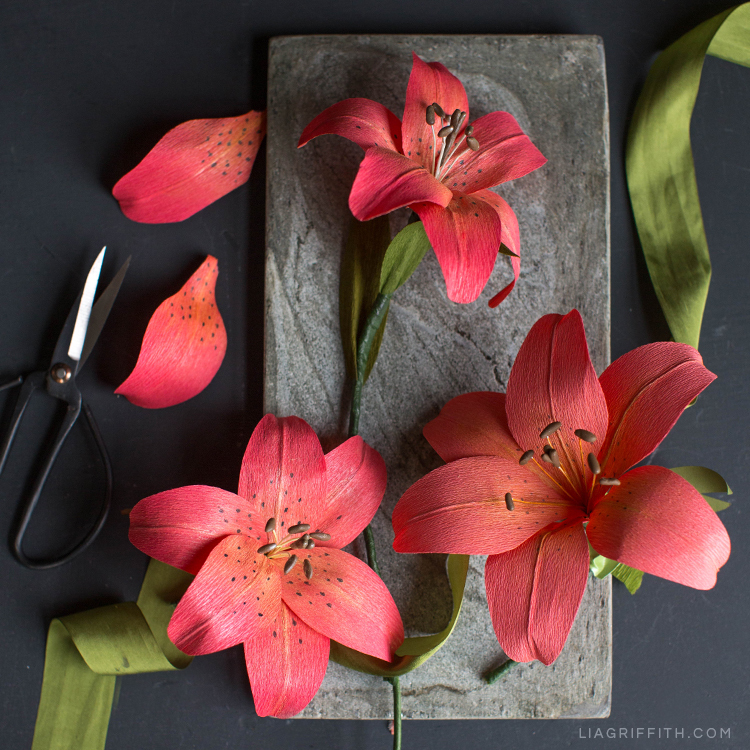 When you’re ready to make your own crepe paper tiger lily flowers, just gather the tools and materials below. You can follow the instructions listed here or watch the video to see how I do it. I definitely go into more detail in the video, so it may be helpful to watch it as you make your own tiger lily. If you have any questions, let me know! Gather tools and materials. Download SVG file or PDF template below. Cut crepe paper according to pattern, paying attention to the grain lines on the template. Cut 6 pieces of white floral wire to approximately 5” long. Dip end of floral wire into tacky glue; place glued wire along flat edge of left facing petal, then place right facing petal on top (covering wire completely). Trim excess paper from bottom of petal. Repeat until you have 6 petals. Use sponge to apply yellow PanPastel, and paintbrush to blend in red. Add small dots to bottom of petals with art marker. Form brown clay into stamen and pistil. Cut 6 pieces of wire, then bend tip 45 degrees. Attach stamen pieces to wires, then 3 pieces of pistil to a single wire. Bake according to instructions on sculpey packaging. Let cool, then color white wires with yellow art marker. Gather pistil in the center and stamen surrounding; wrap with floral tape around 18 gauge floral wire. Glue three petals around the flower center using floral tape. Then, stagger last three petals. Shape petals. If you like DIY flowers with stunning color, you’ll probably like our crepe paper ombré oak leaf branches. And you can find more fall home décor here. We’ll also be sharing new fall flower projects and other fall décor crafts on our social pages. You can find us on Instagram, Pinterest, Facebook, Twitter, and YouTube. Have a flower you’re working on this fall? We’d love to see it! You can share your DIY creations with us on Instagram using the hashtag #MadeWithLia. I would love buy a couple of downloads and instructions for crepe paper flowers. However, I don’t want to commit to a membership package at the moment. Is it possible to buy individual SVG’s and instructions? Hi Christine! At this time we don’t offer a payment per download system. You could join for one month; However, all memberships are ongoing, so you cannot buy a membership for a specific amount of time. You can cancel at any time. If you would like to maintain a membership for one month only, you might want to set a reminder for yourself to cancel before the end of your first billing cycle. Please do let us know if you have any questions! Quick questionn. I just purchased your new book Crepe Paper Flowers, you use an iron adhesive to create your own double sided crepe. Do you use ultra bond, regular or lite iron on adhesive? We’ve used both UltraBond and Regular!